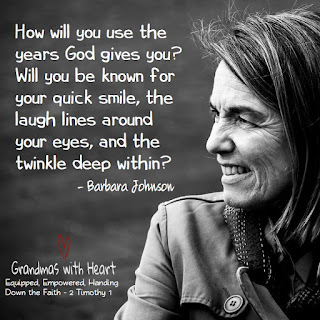 grandma's cookie jar: Use Your Years Well! How do you want to be known . . . and remembered? I want my grandsons to remember I always greeted them with a smile, hug and "I love you!". I want them to remember their grandma was someone who had real joy. Live on purpose. Use your years well and focus on what matters the most - hand down the faith and do it with joy! Enjoy the days before you and be quick to share your love, joy and faith with your grandchildren. It matters now, and in the future.